Dreadknux, the founder of TSS, is also a games journalist, writing for SPOnG.com. 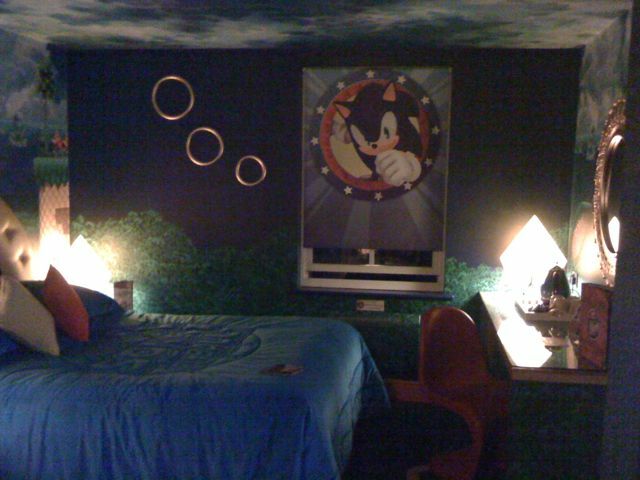 Because of this, he was able to visit Alton Towers and earn the distinction of being the very first person to sleep in the Sonic Suite. He has written his impressions of both the Sonic Spinball ride and the £300-a-night hotel room at Sonic Spinball Opens At Alton Towers – Pix! on SPOnG.com. The picture above is from the article – click to see the rest of them. 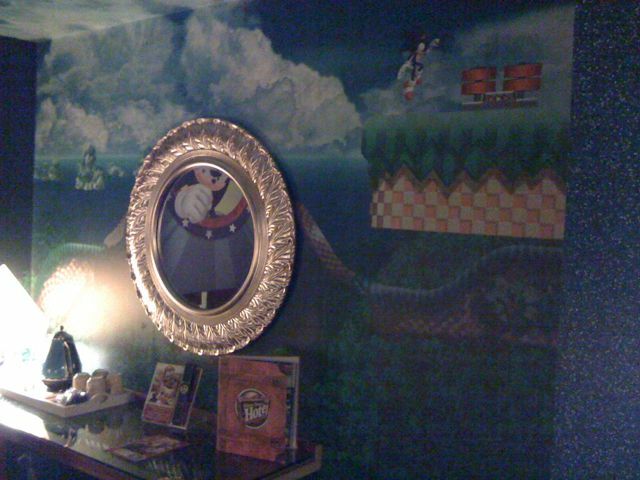 Note the wall decor… it’s more Sonic 4 art! Looks like speed boosters are returning. For those of you rabid for more Sonic 4 media, wallpaper is a rather odd place to find it, yeah? 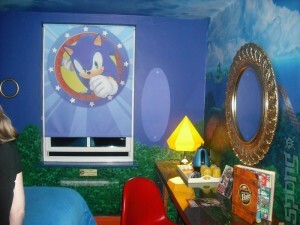 The room isn’t the only Sonic-related happening at the theme park. The rollercoaster, Sonic’s Spinball, is opening this weekend as well. Next Post > Next post: Bentley Jones EP Competition Winners! Wait a second, are they using the art style from Sonic 4 on the wallpaper?!! Look at the one with sonic near the speed catapult thingermabob haha. Yeah I didn’t read the paragraph above.. lol… still that’s awesome! 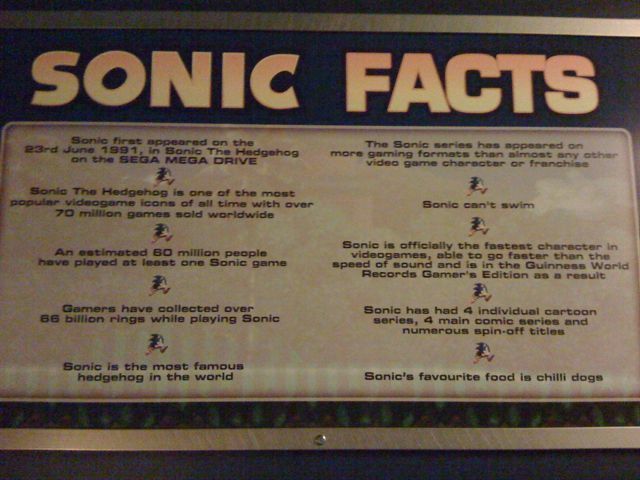 Sonic Facts: Sonic is the most famous hedgehog in the world. i didn’t expect sonic 4 screens there and they look awesome! hope the next info at thursday is a screenshot. A bit smaller than I imagined… Doesn’t it cost a fortune to stay in there? Cool wallpaper in any case. I hope the background is as detailed in the game as it is on that wallpaper. 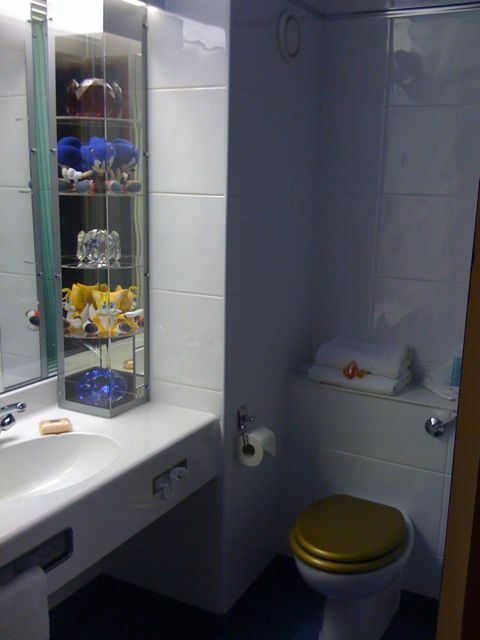 Are those f%$#ing Chaos Emeralds in the bathroom!! I need them! Cool to see more Sonic 4 stuff. I love the jungle scenery. It’s a bit like Sonic Unleashed but more Soniky. Note how the platform Sonic is about to land is a bit closer to the screen than the one that seems to be below it. I said Sonic unleashed, and it seems they’re inspiring themselves more on it than we thought, with the multiple paths. It looks like a good idea for a 2D Sonic game, and we’ve seen something like that on fangame with Knuckles Chaotix sprites. And to people that are upset about Speed Boosters returning, Sonic 2 had them and they worked perfectly, so I don’t see the problem. Can’t wait to stay there myself!!! The guys messed up for Sonic first appearance. It was actually the arcade game Gale Racer in 1990. 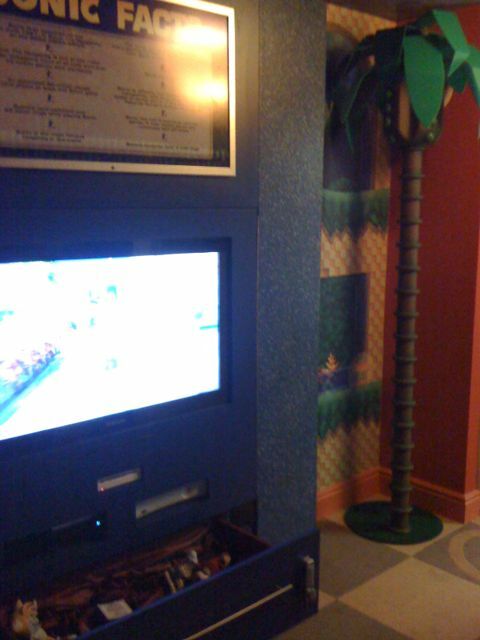 So it looks like the room has both a PS3 and an Xbox 360… wow…. Come June I shall be staying there and I shall take my video camera woo! Must go….Ahh Alton towers is on my doorstep and I’m unemployed, it is so annoying. Dread sure will think he’s in heaven. HA! What a wild place to fins Sonic 4 art! If thats in-game footage, then it looks BEAUTIFUL! @Casanova; Theres a Wii too. Dread, do you get to keep the things in the drawer? I’m going to steal everything in that room when I go…including the toilet emeralds. BLADDER…CONTROL! *Disappears*. the flush button on the toilet should have a sonic 06 logo on it. Man, why cant the U.S. get anything like this????? I’m so jealous right now: I would pay out the crap hole to stay there, but I’d have to cross the Atlantic first. Nice to see more of Sonic 4 though. Back to the speed booster, its design is a throwback to the ones from Sonic Chaos. It’s nice to see a GameGear game get some attention. Before I die I want to make love with a beautiful girl in this room on this bed while shouting “IM THE FASTEST THING ALIVE” all while the soundtrack of Sonic Adventure 2 Battle is playing, my life will be complete. @Lawrence: If you are making love, you probably don’t want to be the fastest thing alive. The girl has to be pleasured, too. Just got back from the Alton Towers trip a couple of hours ago, was friggin awesome. In response to the sonic 4 stuff on the wall – aswell as the classic speed boosters instead of the modern dash pads it seems they are going for a mix of classic and modern items as a spring is also on one of the paths on the wall but its a modern games red spring with a star on. The spring is there on the wall in the photo with the palm tree. I wonder if room service will bring chili-dogs? I agree with Brad, but you should shout “BEHOLD! THE ULTIMATE POWER! !” instead. I think I need that palm tree. Wow….really? You kids actually want to have honey-moons in this room? I hope for your “future” spouse’s sake you grow up by then. Its a fun little gimmick, but that’s all it is. 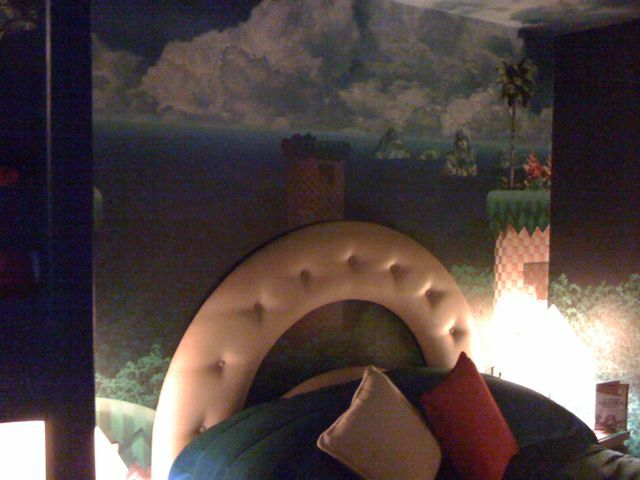 The most epic hotel room ever. I HAVE to go there. Dose anyone have any clue how much longer they plan on keeping that room? BTW, how in the world did they calculate that 66 billion rings? as cool as it is, £350 a night is a bit of a blow, i think i’ll go to tokyo instead for some sonic madness. i’ll still go on the ride and get a tshirt, theres bound to be some exclusive sonic tshirts or summit there . Oh! 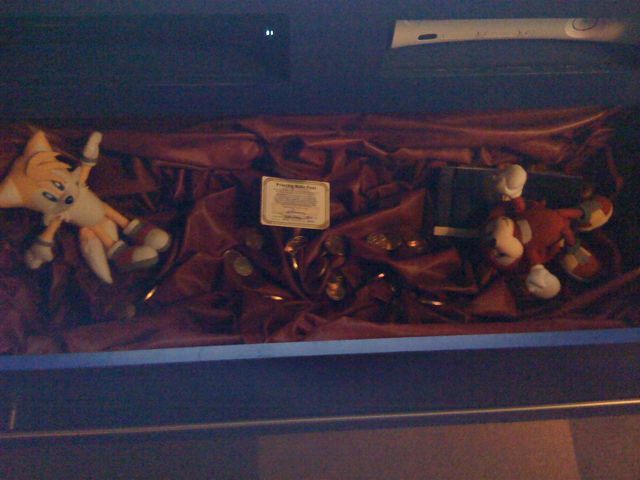 Are those Chaos Emeralds in that display case? Where’s that DAMN 4th Chaos Emerald? @DreadKnux: So, what’s your overall opinion of the Sonic lodging? Is it really as awesome as it looks? The reason I ask is that I know that images can be deceiving. It sure looks suite, though, so hope it was great! EDIT: Found your brand-spanking-new article, DreadKnux. From what you say, this suite sounds like fan heaven. Males NEED to say this: SoS ’11 at Alton Towers. I know this is unlikely, but it would be awesome.